The Bestar Access small computer desk is great for compact spaces and tight budgets. Perfect for a home office or student workstation. Free shipping and warranty available. 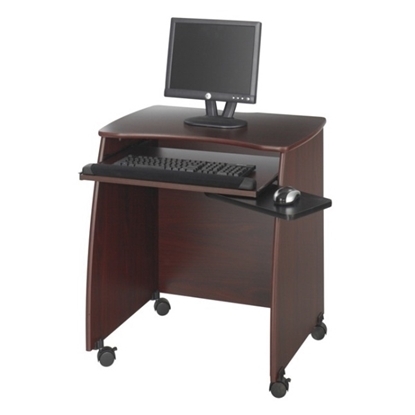 Sturdy steel and durable laminate construction on this Mayline mobile computer cart makes it a great value at an affordable price. Features a slide-out keyboard tray with mouse area and printer shelf. 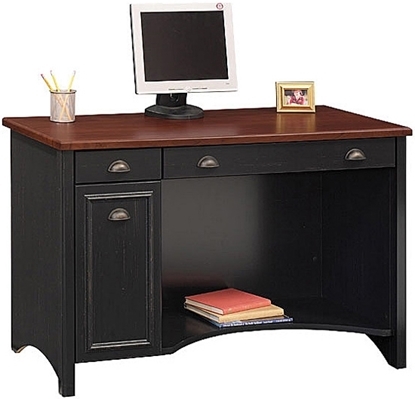 Perfect as a small business desk or student workstation. This mobile computer workstation cart on wheels features a raised flat panel, computer or keyboard surface, a printer platform and CPU storage area. Choose from two different style finishes, Anthracite (featured in photo) and Medium Cherry. Perfect for a medical office or business where mobility is needed. Order today and get free shipping on all furniture! 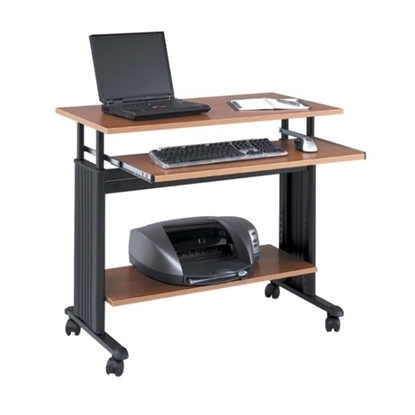 A totally mobile computer cart on four wheels, with two locking, this sturdy steel and laminate unit is ideal for small offices. Perfect for a home office or business where space is limited. This desk is a great value at an affordable price. Free shipping and warranty on all discount furniture. This Mayline computer cart on wheels features a perforated steel slide-out keyboard tray. The mobile Eastwinds series is designed to fit well in a limited work space. 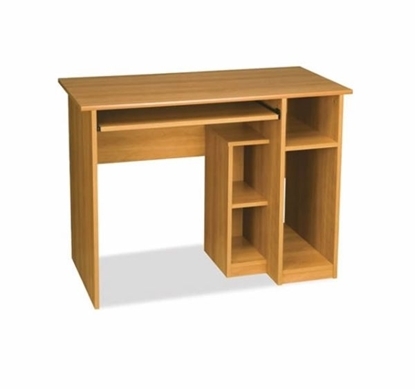 Perfect small desk for a student, business or home office. Free shipping on all office furniture. The Eastwinds 950 is a simple yet functional laptop computer cart on wheels. This mobile cart from the Mayline collection is available in three different colors, height adjustable and ergonomic. Perfect for a medical office, home or business. Warranty and free shipping available. Eastwinds by Mayline includes heavy-duty arched leg design to provide strength and stability. This stylish computer cart with wheels is perfect for business or home office use. Put it in the corner of the family room or in a spare bedroom. Free shipping and warranty available on all furniture collections. This Mayline computer desk has contemporary glass inset on this desk top. The stylish Eastwinds collection is perfect for both business and home office. Use your laptop, tablet or desktop PC with keyboard. A great value at an affordable price. Warranty and free shipping available on all discount furniture collections. Combining traditional detail and contemporary functionality, the Stanford computer desk by Bush is a comfortable addition to any home. The storage configuration maximizes drawer space. Excellent choice for a living room or bedroom. Add a matching file cabinet for extra storage. Get free shipping when you order now! A mobile desk that is great for presentation rooms, multipurpose rooms, conference rooms, and just about anywhere else. This unit features a pull out keyboard tray and privacy panel for cable routing. A desk that can moved when needed, this computer cart sits on 4 caster (2 locking) to allow you to move a digital work place anywhere it is needed. A versatile desk that can be used in a number of settings. This desk features a height adjustable top and keyboard shelf that retracts under the work surface. Accommodate today's large monitors in a compact, yet convenient, computer desk. This Eastwinds desk is sturdy and easy to assemble. Includes wheels for easy storage and mobility. Designed for the latest in office technology, this computer desk caters to business both large and small. Perfect for a student training workstation or medical computer station. Free shipping and warranty on all discount furniture collections. A height adjustable desk that features a pullout printer shelf, durable powder coated steel frame, and keyboard shelf. 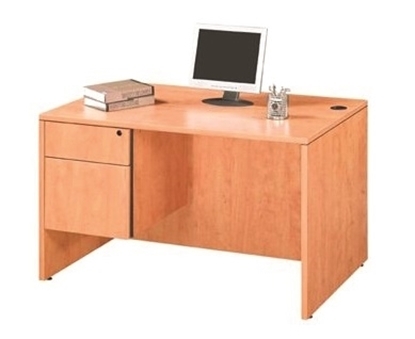 This desk is available in two different top colors and can be adjusted in 1" increments. A great way to add a desk to an area or room where one typically will not fit. This compact desk features thermally fused laminate surfaces and has a pedestal, that ships assembled, for your storage needs. 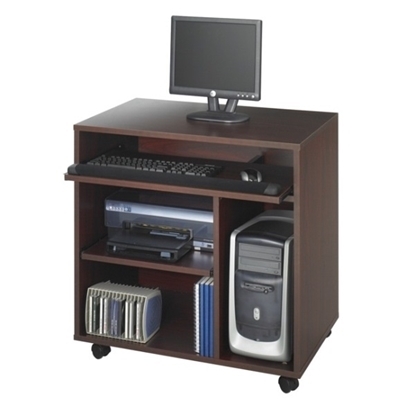 Accommodate today's large monitors with this multimedia computer cart from Mayline. The Eastwinds cart features plenty of space for a wide screen monitor or laptop computer. Includes wheels for added mobility and flexibility. Warranty and free shipping available. 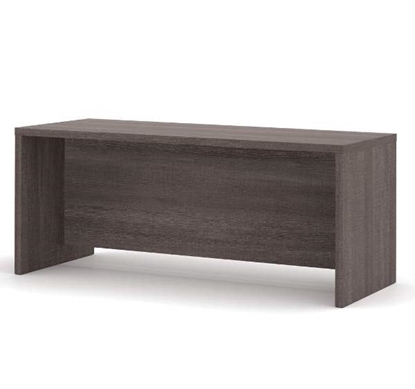 Get plenty of work surface area along with a open spacious feeling with this Table Desk. 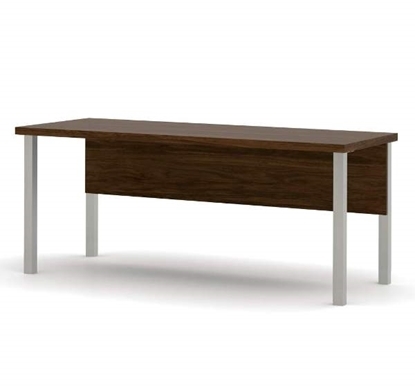 This desk features a 1.5" commercial grade work surface, square metal legs, and is available in 3 colors. A great solution for a simple work space. This basic desk features a 1.5" commercial grade work surface and a deluxe PVC edge and can be used just about anywhere a simple and functional desk is needed.